While open Egyptian Craps you appear in Egypt where a bright and sunny day surrounds you. Straight in front you see one of the grandest rivers of the world. It is Nile. And near the horizon line you see the pyramids which are the most enigmatical constructions on the Earth. The boat is floating slowly down the river and lengthways the banks many delicate water lilies are in blossom. This tranquil and at the same time majestic picture inspired the designers to create Egyptian Craps. So they combined the beauty of nature, the tenderness of music, the splendor of ancient architecture and the achievements of modern graphics in one game! 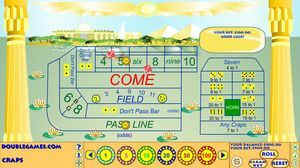 Egyptian Craps is not a simple game on a classical table with marking this is an enjoyment from beauty and victory! Throw the dice and commit yourself to Fortune's care. While the dice are rolling listen to music and relax! Your winning is waiting for you! Lotto Sorcerer - Full-featured lottery software with predictive technology. Since 1989. This program uses neural networking technology to find a pattern to prior draws. Also features lottery playslip printing functions, 7,000 wheels, much more. For Windows XP on up. SamP3P4 - The great lottery software SamP3P4 since 2003 and continued strong. SamP3P4 software works with all the Pick 3/4 lotteries and supports 120 lotteries from the USA and Canada. Lotto007 Pick 3 Pick 4 For Prediction - Lotto007 Pick 3 Pick 4 For Prediction 2018 can help you predict the next drawings and give you drawings trend chart for the pick 3 pick 4 daily lotteries. The 2014 version supports historical drawings verification. Pretty Good Solitaire - Pretty Good Solitaire is a collection of 960 solitaire games. It features lush graphics, beautiful easy-to-read cards, sound, in-depth statistics, and solitaire for points in solitaire quests. Lotto Pro - Unlike many other lottery programs that simply generate random numbers, Lotto Pro picks the best numbers to play based on a statistical analysis of previous drawings. Helps you to play the lottery with control, not guesswork.